Ecuador culture is one thing we love about Cotacachi Ecuador also has things happen that North American minds can never imagine. 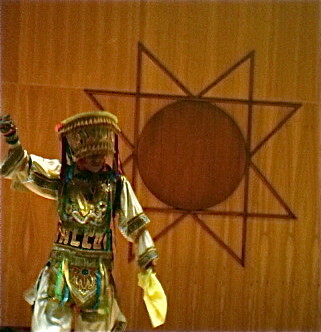 Take this musical dance treat that our Ecuador import courses delegates just enjoyed. 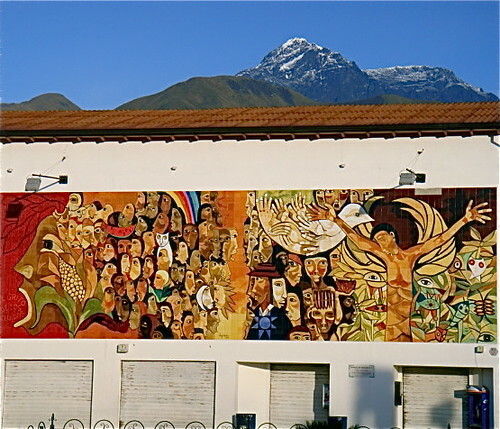 Cotacachi has two cultural centers… one is here upstairs over the local super market (take that word lightly). Mt. Cotacachi is in the background. Crowds gather here and head upstairs on the metal staircase. Here we are heading in. 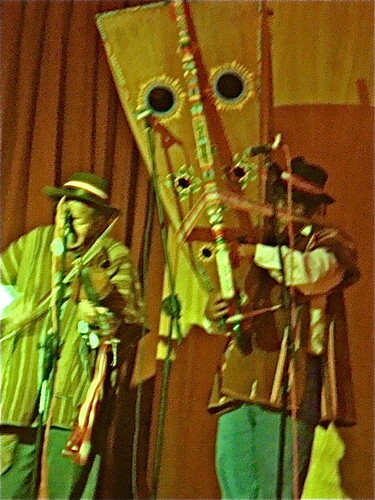 had a great sound… guitar, cherango… pan pipe… flute… drums and it moved. The singer dancer was a hoot. 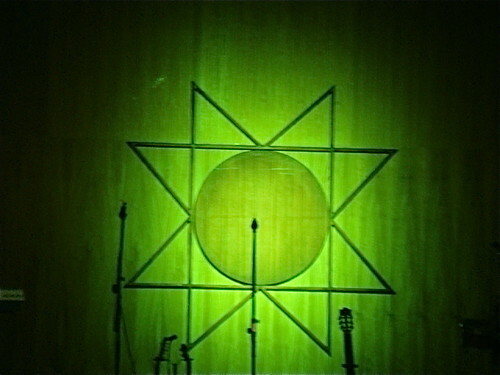 That is all I can say… a sing song high pitched sound that puts Kate Bush to shame called the Harawi. 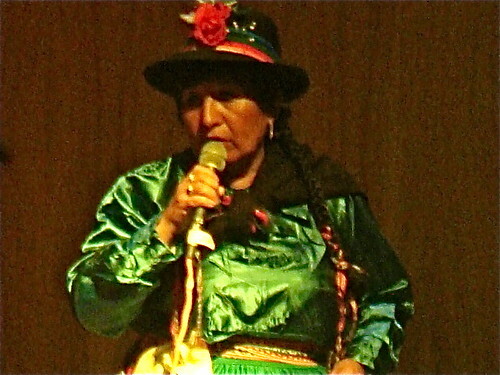 This is a musical style filled with sadness and longing, perhaps the oldest musical style in Peru that dates back to a form of poetry recited in the Inca era. The tinny music is interrupted by frequent periods of silence that bring a dramatic feel without much rhythm not generally danced. The Scissors Dance. This is an exhibition of physical prowess, a complex ritual shrouded in mystery and put their dexterity to the test with a series of leaps accompanied by a harp and violin. The ritual stunts they perform are accompanied by the scissors, made up of two sheets of metal which together form the shape of round edged scissors. 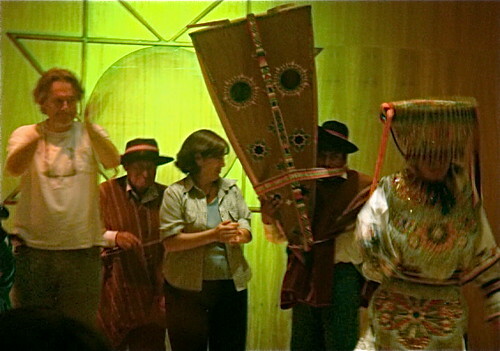 This is usually performed in Lima, Ayacucho, Apurimac, Arequipa, the Ica highlands and Huancavelica… but we enjoyed it here in Cotacachi. 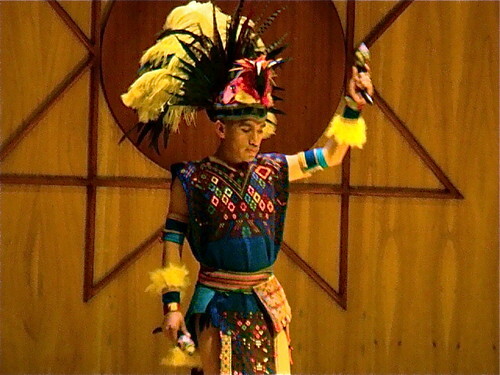 The scissors dance seems direct from the Cossacks… but like the Chinese opera sound above they were all from Peru… but were with us in Cotacachi. 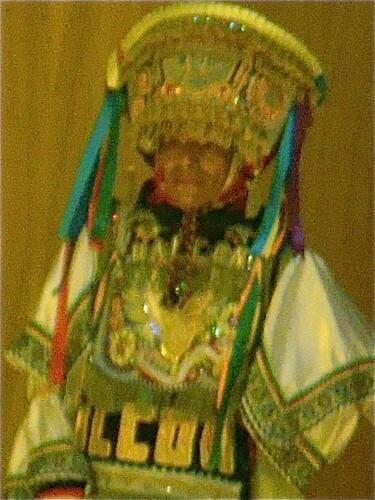 This performance left little doubt about an ancient Asia Peruvian connection. Then they brought the audience on stage and had them running round the theater, an odd, fun filled conga line. 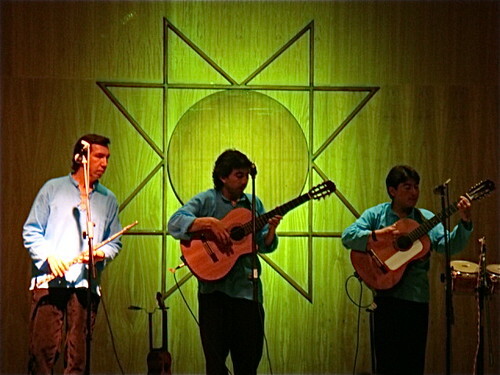 This was just one of the great cultural events we have enjoyed in Cotacachi. See more pictures of this performance here. Another exclamation point in our Cotacachi cultural lives took place when Dr. Ramiro Ruiz, former Mayor of Cotacachi and director of the Cotacachi Cultural Museum that sits next door to our hotel had sent an invitation to a little concert at the San Francisco Temple, the second, smaller Cathedral in the village. Wow, we thought. What’s going on? This was the second invitation we had received for the upcoming Saturday. We are not socialites and we normally do not attend events (too much work here and these pesky messages I love to send every day). We had to make this concert. So we accepted and wondered how the evening concert would be. Seminar delegates were , so we asked if they could come along and 18 gringos in hand, we headed across the village early to enjoy the evening Mass at the temple. Here is a picture of the temple. Merri and I are not officially Catholic, but we take any opportunity to worship God we can get. To us Worship is Worship and we suspect that God does not pay too much attention to whether prayers in Spanish, Latin, English, Italian, Chinese, Quichua or whatever. Nor, I suspect, is the Infinite very caught up in minutia of Worship. So we enjoyed the celebration, ritual, singing and chants in this small temple which is about 100 feet wide and 300 feet long. All the time I was wondering what type of concert this would be; a local group perhaps, a children’s affair…maybe a good string quartet. I was hoping for this last option. Merri and I love good classical music and have heard some of the best in the world. 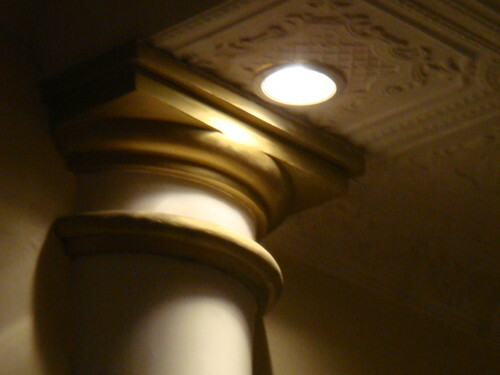 Our offices at one time, when we lived in London, were on Wigmore Street right next door to Wigmore Hall which was the national concert hall for chamber music and song. There were regular performances of song recitals, chamber, piano, early music and jazz concerts. Then it had been easy to pop in and hear a grand pianist, flutist or other famous artist. The London Philharmonic was also within easy reach easy. We also had years in Vienna and frequented the Vienna Konzerthaus where there were regular concerts of Mozart, Strauss and performances by the Vienna State Opera. We also often stopped at the Vienna Kursalon which was built in 1865 and served as the Ballroom of Vienna. The Strauss family celebrated their greatest triumphs there and any night one could sip coffee and listen to wonderful live performances. Then in Naples we enjoyed the Naples Philharmonic which the wealthy Neapolitans used to spend their money, by filling it with only top performers and stars. These musical opportunities all offered us only the best. Even in my Hong Kong days, my flute instructor was a flutist for the Hong Kong Philharmonic. They were not the best orchestra in the late 60s, but I was allowed to practice in the musician’s practice rooms at the HK philharmonic Hall. When they performed, I was often there. Plus we visit Copenhagen every couple years to speak at Jyske Bank’s courses which include performances by the Royal Danish Opera. They perform at all of Jyske’s seminars and Merri and I have spent evenings enjoying dinner with some of their stars before being entertaining grandly. I am certainly no aficionado nor expert but I do enjoy music and from these experiences understand it a bit. So I was not getting my hopes up here, in Cotacachi, a tiny village of 6,000 people, deep in the Andes in a very small, but acoustically sound, as it turned out, temple. What could they put on here, really? At the end of the Mass Service the children outside the temple started with the sky rockets and fireworks. There are no regulations about fire crackers and such in Ecuador so almost anything up to a stick of dynamite (to the distress of our hound dog, Ma) goes. 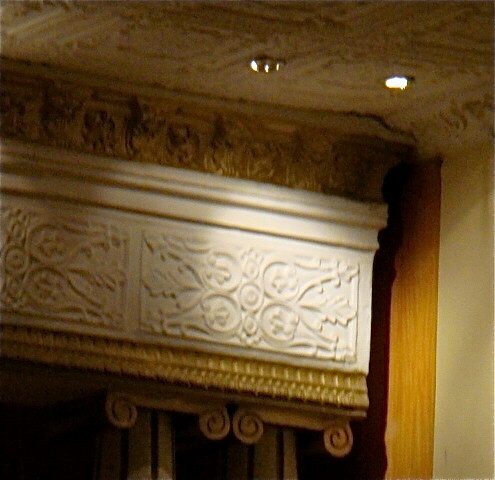 When one hot shot let off an M80 on the temple’s front porch we all jumped and I knew that the marble in the temple helped sound carry! “Whoever performs tonight,” I thought, “will be heard”. 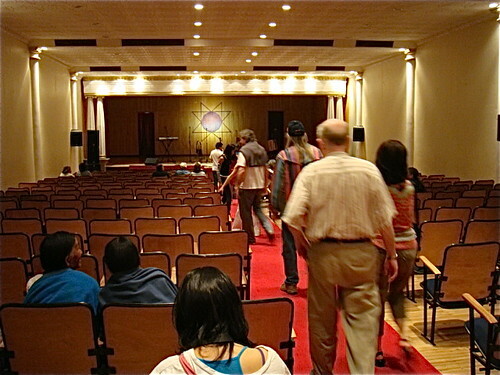 With Mass over, attendants arrived and began removing pews. I wondered. 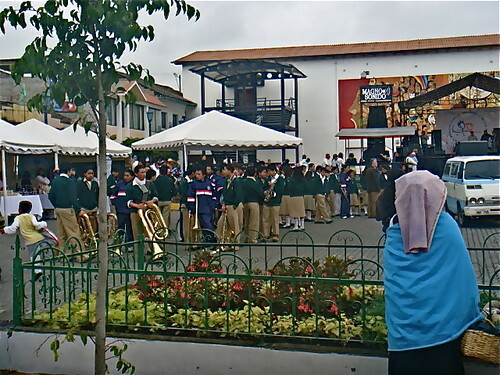 “What?” Then they began flowing in…the entire Orquesta Sonfonica Nacional del Ecuador…THE NATIONAL SYMPHONY OF ECUADOR, 72 performers, two bassoons, a double bassoon, timpani and all, celebrating their 50th year. They gathered, went through those comforting warm-up rituals and then, just seven pews in front of us, the conductor, Medardo Caisabanda, arrived, turned to face the orchestra, raised his baton and nearly brought the ceiling down! 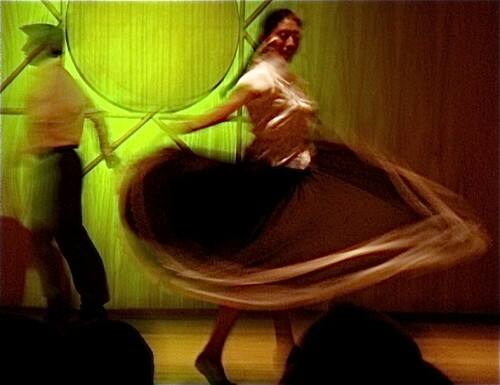 They began with Obertura Caballeria Ligera and moved into Brahms’ Hungarian Dance #5. Crisp, perfectly timed and when they put their musical peddle to the metal in Forte the effect is hard to describe. My spine shivered, heart fluttered and tears to the eyes, even now just remembering. The music grabbed our bodies….and our souls. 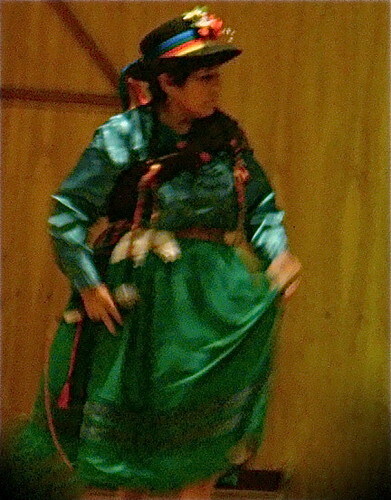 Ecuadorian performers are much more physically enthusiastic than their Northern brethren. Unlike the no move, stone faced performances often given by great stars in the US, Canada or Europe, these musicians move, smile, sway. You see, as well as hear. When the orchestra erupted in this tiny hall, you literally felt their enthusiasm. Later, as our group strolled down the lamp lined streets toward El Meson, the cool, star studded evening was dessert after this exquisitely performed musical meal. This will be a time always remembered, I suspect for the entire 150 people or so in attendance. The National Symphony of Ecuador was in our lap. And for everyone it was free! This was one of those rare, unexpected peak moments that grabbed us, carried us and it will stick, a wonderful memory. This was a thrill beyond explanation that I hope sharing will express the joys that can come from visiting our tiny village in Land of the Sun! Cotacachi cultrual events are tops. There is a circuit. Quito, Guayaquil, Manta, Loja, Ibarra, Otavalo and Cotacachi… so if you are worried about culture, Cotacachi is a great place to be.